Check in is at our dive shop in Cabo San Lucas at 7:15am and then we drive 45 minutes to our sister location in San Jose del Cabo. We board the boat to Gordo Banks in San Jose and It takes between 40-60 minutes to reach the dive site by boat. We conduct 2 deep dives with a long 1.15 hour surface interval between dives. Depending on the sea conditions we get back to the marina in San Jose del Cabo at almost 1 pm. Finally after rinsing the dive gear we drive back to our shop in Cabo San Lucas. Gordo Banks is located 8-10 miles off-shore from San Jose del Cabo. There are different seamounts, while the top of one is approximately 120 feet, the other is at 180 feet. This is a unique location where the hammerhead sharks gather in large numbers, but please be aware that the sightings are not guaranteed. Schools of jacks, mackerels, tunas, snapper, groupers, eagle rays, cow-nose rays and mobula ray are also common visitors at this offshore reef. 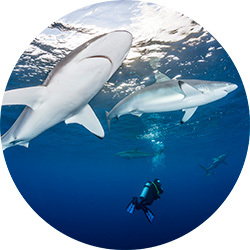 Silky sharks and whale shark may be seen with a bit of luck in the cooler month from April – June. Due to the advanced conditions at Gordo Banks there is no time to adjust weights, gear etc. at the surface, this needs to be done prior to this dive. Please also note that this a hit or miss dive. The dive conditions at Gordo Banks can be quite challenging, due to the depth, strong currents, visibility and heavy seas. Therefore we require all divers (with less than 100 logged dives) to do a local 2 tank dive in the Cabo San Lucas marine park or at the Corridor prior to diving at Gordo Banks.